Get a personalized monochrome caricature drawing of 2 or more persons, who are the best friends from college, school or work. Such an original idea to draw best friends caricature helps you to get a personalized caricature for a unique gift on any occasion to your bestie. 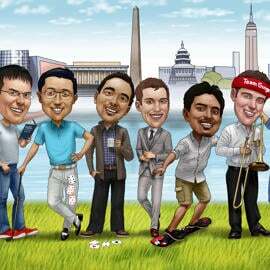 Whether you are girls or boys, funny caricature featuring two or more friends will surprise anyone who get it even as a keepsake, sent by Email. Pencils Caricature will be delivered as JPG File of a high resolution on Email for your approval. Additional suitable deliveries at extra cost: original caricature on paper of high quality, caricature printed on canvas, photo paper or coffee mug of the selected size. Worldwide shipping is available.